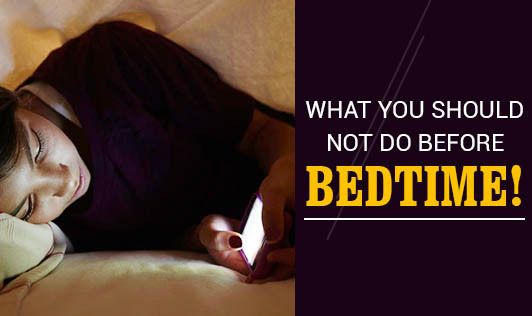 What you should not do before bedtime! Getting a good night's sleep and starting your day with energy is the best thing you can do for yourself! With a few small changes to your morning and nightly routines, you can feel more active and awake during the day. • Exercise is important and critical for a healthy body. However, there is a time to exercise your body. Any kind of physical exercise within 3 hours of going to bed can increase one's body temperature, making it difficult to fall asleep. Hence, the best time to exercise is early in the morning or in the evening. • Having serious conversations can make one angry or frustrated and keep the mind occupied. When you try to sleep, these thoughts act as a distraction and prevent you from sleeping. Studies have shown that sleeping right after a fight preserves the emotions until one wakes up in the morning. It's good to avoid talking to people who have the capacity to make you angry. • Watching TV or surfing the net before going to bed can also disrupt your ability to fall asleep. Studies have shown that going face to face with screens before going to bed reduces one's ability to sleep because the glowing lights coming from TV and laptop screens decreases the production of Melatonin which is the hormone that is responsible for making one fall asleep. Hence, all sorts of screens should be avoided at least an hour before going to bed. • Taking a shower before going to bed can induce sleep. However, taking a shower with hot water can raise the temperature of the body for some people, making it difficult to fall asleep. The body temperature drops at night but a hot shower raises temperature taking away the relaxation. • One should never overeat before going to bed as heavy meals before sleeping stimulates the brain waves which can result in bad dreams at night. These dreams may become worse if you eat anything unhealthy. Try to make these small adjustments to get a goodnight's rest!